When the 5th Summit of the Americas, which included heads of government for 34 countries, was scheduled for Trinidad and Tobago recently, officials there had work to do to get ready. Near the top of the list was the Piarco Airport which had to be transformed into a facility capable of handling U.S. President, Barack Obama’s Air Force One, as well as a variety of jets including Boeing 757, 767 and Airbus A319 aircraft. To ready Piarco for such a fleet required extending the east and west aprons and laying five separate aircraft platforms. These platforms were scattered across the airport grounds and included a VIP terminal constructed for the event. Jusamco Ltd., the prime contractor, was under obvious pressure to meet narrow time constraints. In order to meet the required dates, they called on Airside Installations Ltd., of Peterhead, Aberdeenshire, Scotland to take on the concrete paving. Jusamco and Airside had collaborated on previous projects. 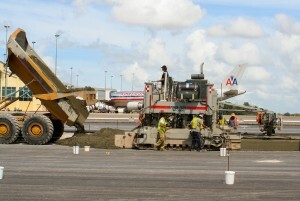 As paving projects of this scope are unheard of in Trinidad and Tobago, Airside arrived there equipped for the job. In addition to the 9.75m Power Paver SF-3000 Airside brought its own central mix batch plant and drilling, sawing and sealing equipment. They then designed the pavement concrete using locally sourced limestone aggregate and Trinidad cement. The work involved 15,000 square meters of surface area that was laid over 12 days, with the Power Paver being moved between the different apron areas each day to suit the overall asphalting program. The asphalt areas between aprons required the SF-3000 to be loaded onto a truck for moves. “Being able to move the machine without breaking it down made all the difference as we moved from one area to another. The loading legs made it easy” stated Kevin Oliphant, Managing Director of Airside. The SF-3000 was set up to pave six meter wide strips at 480mm deep at a rate of over 100 cubic meters per hour. Longitudinal joints were dowelled with 40mm bar at 480mm centers and the slab was sawn and sealed with fuel proof silicone sealant. Airside completed the job on schedule and with excellent results. Oliphant described the SF-3000 as producing a “first-class finish” and looks forward to his next project, whether it be in the Caribbean or home in Scotland.